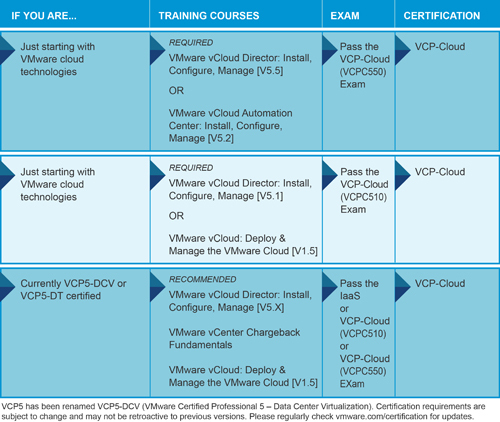 On Feb 18, VMware announced new exam for VCP-Cloud certification, now it’s possible to take exam based on both “vCloud 5.1” and “vCloud 5.5 & vCAC 5.2”. As for “vCloud 5.1” the exam code would be “VCPC510” and for “vCloud 5.5 & vCAC 5.2” the exam code would be “VCPC550”. Also, based on foot note, it’s still possible for existing VCP5-DCV and VCP5-DT to take 3rd exam called “IaaS” with exam code of “VCPVCD510”.